Since 1869 the name Mühle is a byword for precision measuring. The foundation for this was laid by Robert Mühle who began manufacturing measuring instruments for the watchmakers in Glashütte. We are still devoted to precision measuring since 1994, however, in the form of nautical instruments and high-quality wristwatches. In 2019, we are celebrating the 150th jubilee of the company’s founding by Robert Mühle and the 25th anniversary of the family company’s re-establishment by Hans-Jürgen Mühle. The Robert Mühle Zeigerdatum is now the leading model in an illustrious collection of time measuring instruments fitted with the rare complication: pointer date. The function and design of the S.A.R. Rescue-Timer were to a large extent determined by the captains in the German Maritime Search and Rescue Service. This practical orientation resulted in an exceptionally robust watch able to meet any challenge. The nautical origins of our company are also reflected in an elegant watch family such as the Teutonia. Even our classical timepieces are first and foremost instruments for measuring time and have to measure up to the nautical virtues. We consider a good clarity of display to be one of the key requirements of a watch. The 29er therefore fully avoids any superfluous embellishments, instead choosing to shine with its luminous hands and reduced dial. 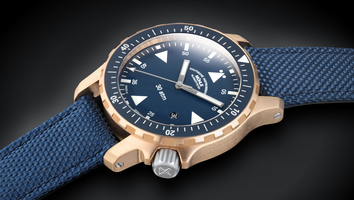 Mühle-Glashütte produces marine timepieces for professional shipping. Our nautical instruments are robust precision instruments that can withstand both storms and high waves and are truly in their element in extreme wind and weather conditions.